Apple sleeping 4, sits in a peaceful location overlooking the old orchard brimming with wild flowers. 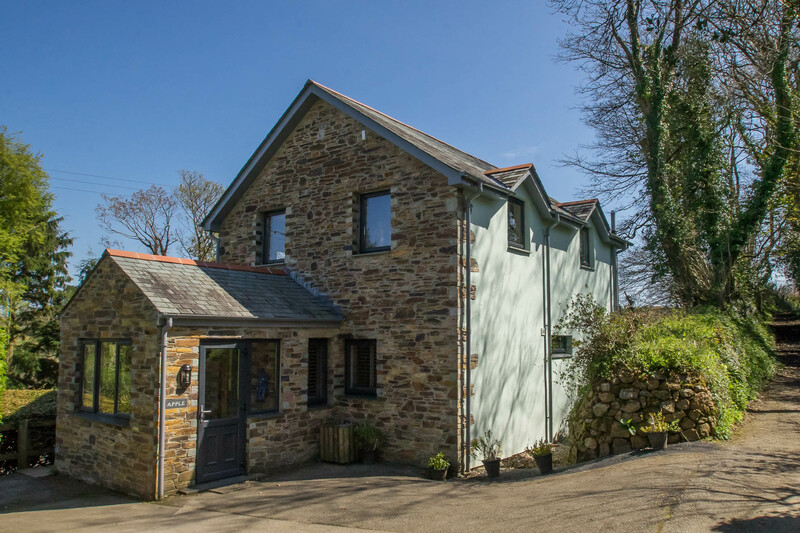 The cottage has two storeys with the living area upstairs to make the most of the stunning views, with patio doors to a balcony to let the sunshine in and take you outdoors for alfresco dining. 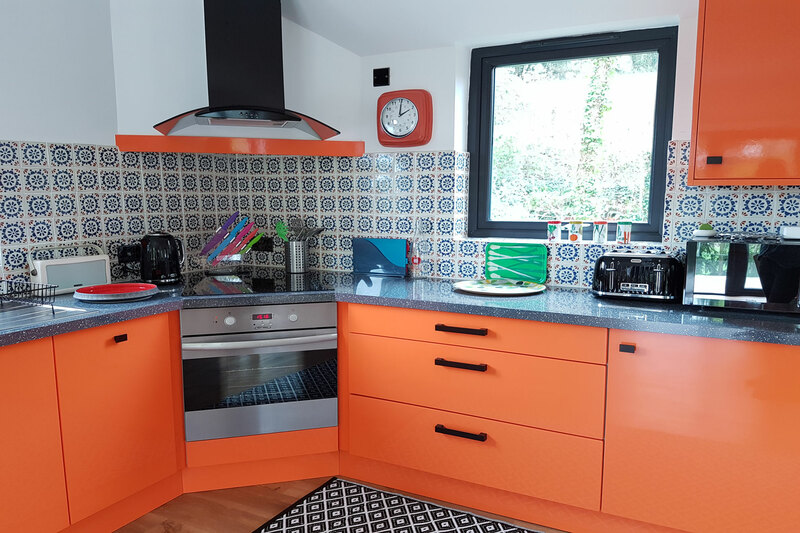 Upstairs is an open plan, living/kitchen/dining area, designed for the whole family to relax in, with a cool, 70’s inspired bright orange kitchen including a large Smeg retro styled fridge. The comfy sofa has views in every direction through the large windows. Patio doors open onto a balcony which we are sure is going to be everybody’s favourite dining spot when staying at Bosinver. 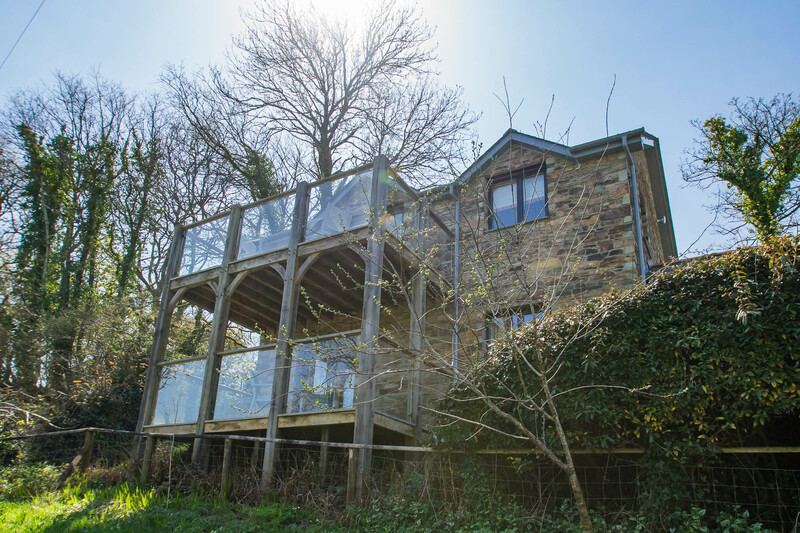 The views are quite delightful – and the peace…..
Downstairs are the two bedrooms. 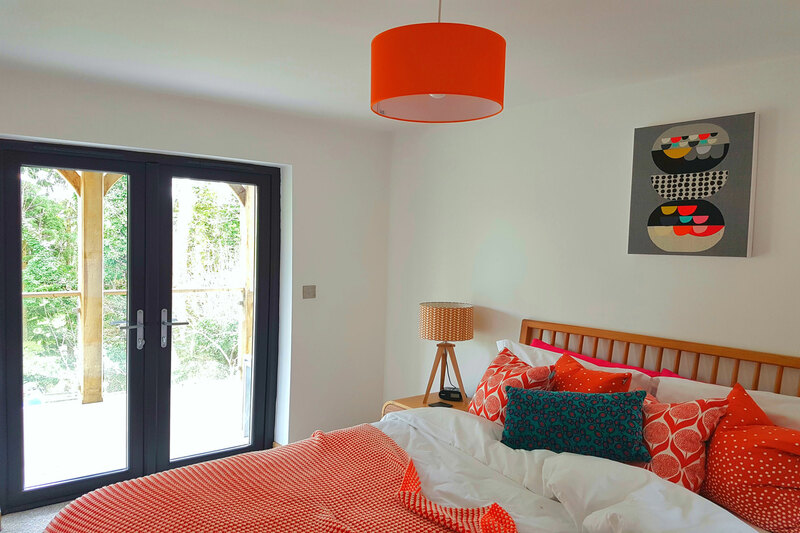 The master bedroom also has its own balcony for a cosy glass of wine or a much needed book read after the children have gone to bed, watching the sunset and the rabbits playing in the orchard. The kingsize bed is Ercol, strewn with bright cushions. 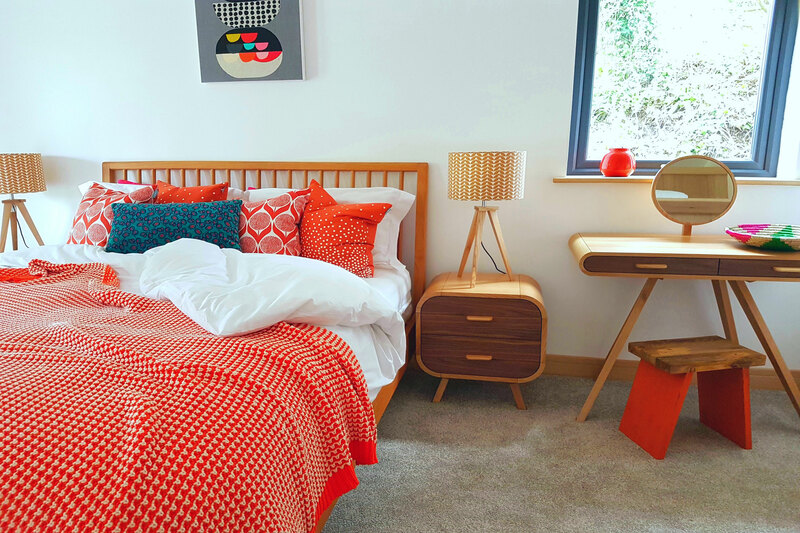 Retro oak furniture completes the vintage feel. 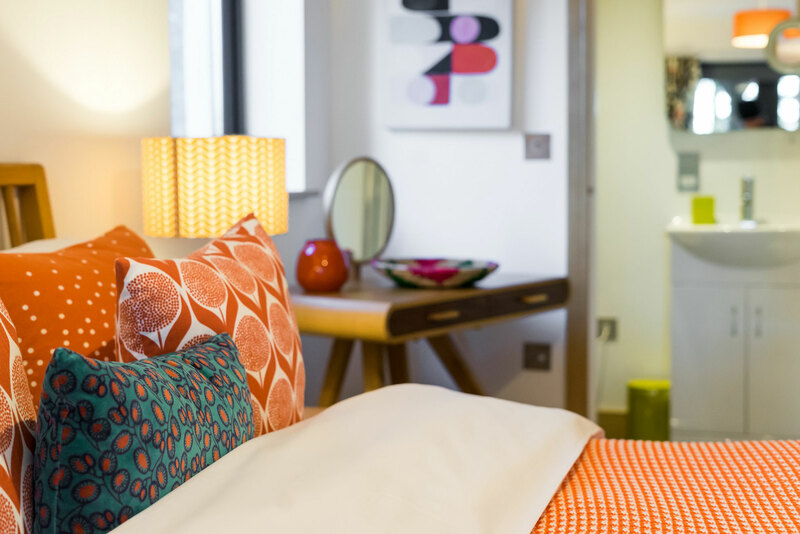 This bedroom has its own funky en-suite with shower. 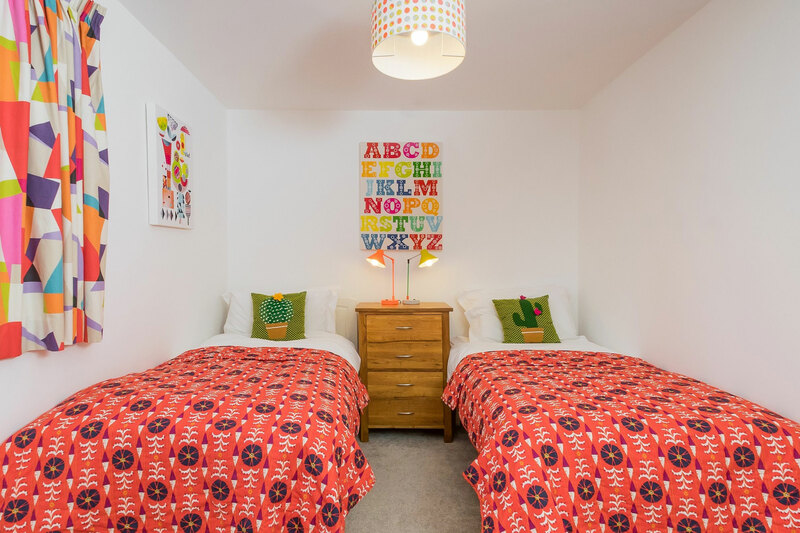 The second bedroom is a twin with ample room for a cot even if both twin beds are occupied. It is bright and cheerful with a view over the orchard. 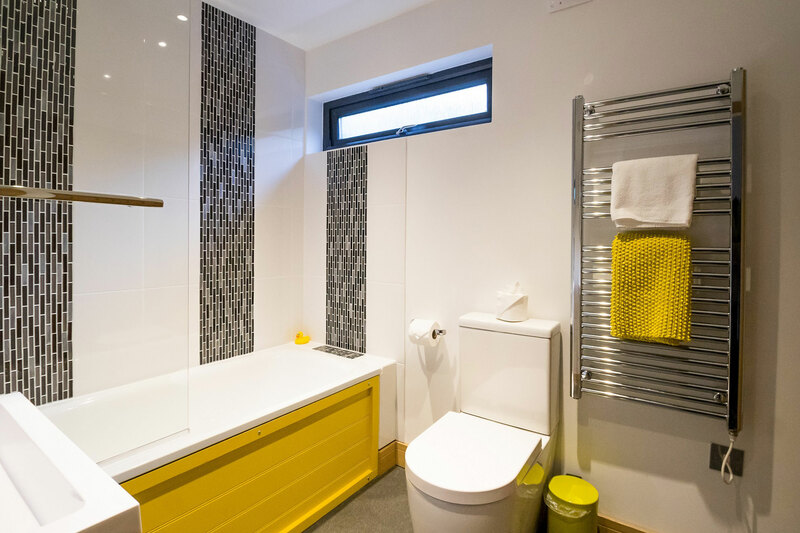 The spacious main bathroom is ultra-chic with its black and white tiles and bright yellow accessories. There is a bath with shower over and basin and w.c. with a large under-stairs cupboard for storage. The entrance porch to Apple is large with plenty of room for boots and coats, strollers and all the kit you take on holiday. 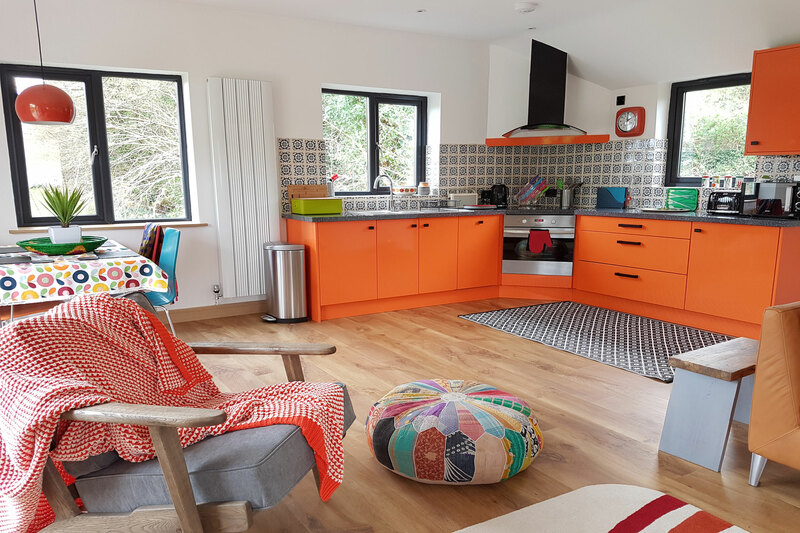 The cottage is now powered by Air Source heating – a further commitment by us to green energy and keeping our business sustainable for the future. Best for: Two couples or families with children/toddlers. Please note: Apple cottage no longer takes dogs. Sleeps 4 in 2 bedrooms, on one level. One kingsize double with ensuite shower room, (with w.c and handbasin). Twin room with additional bathroom (bath with shower over, basin and w.c). On two storeys, parking alongside the cottage. 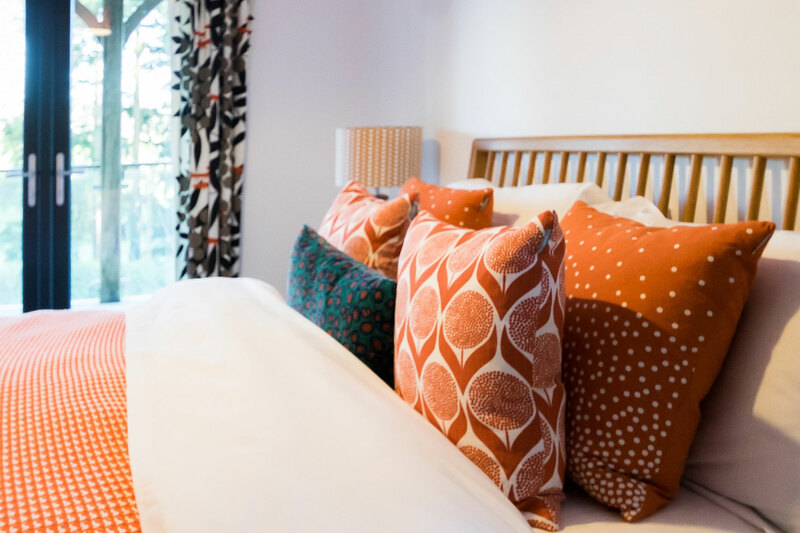 The cottage has a small folding wooden cot (36 x 21 inches, 92 x 54cm) which can be used in the double or the twin bedroom even if both beds are occupied. On request a travel cot may be booked instead. Air Source heating – a further commitment by us to green energy and keeping our business sustainable for the future.